On December 31, 2011 the Swiss high-tech company TBM Automation AG took over the business unit ‘Flow Sensor’ of Anvil Developments in Switzerland. The engineer, Rudolf Bosshard reached the age of retirement, and as the owner of Anvil Developments has ensured a flawless succession in the future. For about 20 years this technology specialist has been developing and distributing leading sensors for media-flow measuring in shot peening and blast cleaning machines in the aerospace industry. 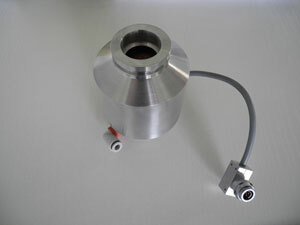 The sensors are mainly used in the surface treatment of aero engine parts, e.g. in Baiker machines. For over 20 years now, TBM Automation AG has had a well-known reputation as a control specialist in both the aerospace and automotive industries. With the acquisition of Anvil Developments’ business unit "501-506 Flow Sensors" TBM Automation AG has now completed its range of products with the measuring technique for shot peening and blasting. The transfer phase, which included intensive training, was completed at the end of January 2012 and TBM is now ready to deliver the sensors from stock. For previous Anvil Developments’ customers, this ensures long-term reliability of supply and support for their high-tech equipment.